Johnson Space Center Director Ellen Ochoa, left, welcomes Houston Mayor Annise Parker to the 2013 Rotary Space Gala at the Downtown Hyatt Regency Hotel. THE ROTARY Space Gala is always one of the grandest nights of the year for the space community, and this year was no exception as a black tie crowd of some 800 toasted the achievements of 2012. And, saluted a very special lady, honoree Kay Bailey Hutchison – the former senator from Texas who has done so much for NASA and the Johnson Space Center. 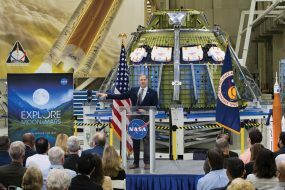 “What are we going to do without her?” was the question on most everyone’s lips as they recalled battle after battle she waged and won for the space industry. NASA Administrator Charles Bolden jetted down from Washington to see her presented the National Space Trophy, as did Congressmen Pete Olson, while former NASA Administrator Michael Griffin and his wife, Rebecca, came up from Huntsville, Ala.
All wore big smiles as Apollo astronaut Gene Cernan, the last man to set foot on the moon and a former National Space Trophy recipient, made the presentation before a glamorous crowd headed by Johnson Space Center Director Ellen Ochoa and her husband, attorney Coe Miles, that included Boeing VP and GM John Elbon, United Space Alliance President Virginia Barnes and her husband, Toby; Maj. Gen. (Ret) Joe Engle and his wife, Jeanie; and Lt. Gen. (Ret) Thomas Stafford. 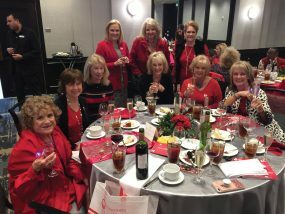 There were smiles all around the table as former Sen. Kay Bailey Hutchison was honored at the Rotary Space Gala at the Downtown Houston Hyatt Regency. They are, from left, seated, JSC Director Ellen Ochoa NASA Administrator Charles Bolden, Senator Hutchison, Capt. 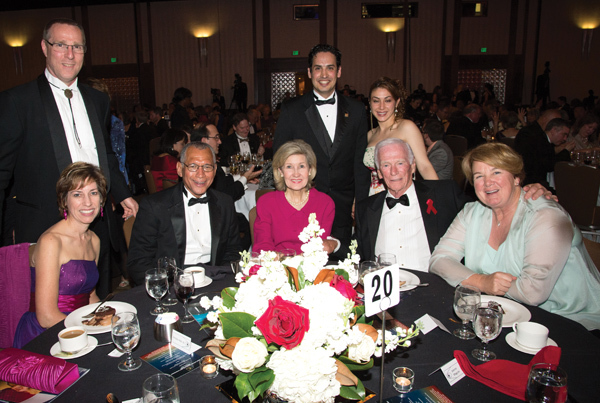 Eugene Cernan, Joanne Macquire; standing, Dr. Ochoa’s husband, Miles Coe, and RNASA Gala Chairman Rodolfo Gonzalez and his wife, Anangela. Early arrivals included Jacobs Engineering GM Lon Miller and his wife, Michele; Lockheed Martin VPs Cleon Lacefield and Richard Jackson, with their wives, Janice and Karen, and Richard Hieb; Sierra Nevada President Mark Sirangelo, Rebecca and Orbital Sciences VP Frank Culbertson; Carol and Anadarko Industries President Tom Short; Lori and Oceaneering VP and GM Michael Bloomfield; Honeywell Manager Brett McAlister; John and GeoControl Systems President Rose Zarcaro, Bastion Industries CEO Jorge Hernandez and COO Jayant Ramakrishnan and MRI Technologies partners Tim and Debbie Kropp. Plus a crowd from JSC including Mission Operations Director Paul Hill and his wife, Pam; Engineering Director Lauri Hansen and her husband, Bob; External Relations Director Mike Kincaid and his wife, Holly; General Counsel Bernie Roan with wife Debbie; Flight Crew Operations Director Janet Kavandi and husband, John; JSC Planning Manager David Leestma and his wife, Patti; and ISS Manager Michael Suffredini, to name a few . Martha Ferebee, fourth from left, is greeted on arrival at her 75th birthday celebration at Perry’s Italian Restaurant by long-time pals, from left, Alice Marinos, Angie Weinman, Tonya Ferris, Ava Galt, Kay Smith, Ann Wismer and Betsy Bush. Gala Chairman and RNASA President Rodolfo Gonzalez and his wife, Anangela, were on hand to greet the arriving crowd, along with Space Center Rotary President Marilyn Musial and husband, Wayne, President-elect Sheryl Berg and husband, Stuart; and Rotarians Dr. Jean Walker, Susan and Bill Taylor, Geoff and Vivian Atwater, Ted and Marianne Dyson, Kippy Caraway, Frank and Rosalind Perez, Karen and Gary Johnson, Jordis and Bob Wren, Daryl and Monique Smith, Mike and Tery Hernandez, Scott and Martha Rainey and Joyce and Rotary District Gov. Chris Schneider and District Gov. -elect Bob Gebhard and their wives. Past National Space Trophy winner Eugene Kranz and his wife, Marta, join the crowd at the Rotary Space Gala at the Downtown Houston Hyatt Regency Hotel. In the crowd were several previous winners of the National Space Trophy — Lt. Gen. Tom Stafford, Tommy Holloway, Dr. Glynn Lunney, Col. Eileen Collins, Gene Kranz, Capt. Eugene Cernan and Dr. Michael Griffin – many with their spouses. And, a number of astronauts, including Michael Fincke, William McArthur and Andrew Feustel with their wives, Renita, Cindy, Indira; Michael Foreman, Nicole Stoutt with her husband, Chris; Don Pettit, Ron Garan and Michael Fossum with their wives, Michelle, Carmel and Melanie; Lee Morin, Stephanie Wilson and Sandra Magnus. Glancing around, you might also have spotted HomeTown Bank Senior VP Mike Duckworth and his wife, Barbara; Bay Area Houston Economic Partnership President Bob Mitchell and his wife, Brenda; UH-Clear Lake Business Dean Dr. Ted Cummings and his wife, Leslie; the Brian Lunneys, Kim and Susan Morris, Hank and Helen Hartsfield and Pat and Wendell Wilson. Dr. Pat Wilson, author of Eagle on Ice, congratulates Stellar Award winner Ven Feng, who was Pat’s second grade student at Ed White Elementary in El Lago, during Rotary Space Gala. The Wilsons were pleasantly shocked when JSC engineer Ven Feng’s name was called out as one of the Stellar Award winners. Pat had taught Ven when he was in the second grade at Ed White Elementary in El Lago and had lost track of him and his wife, Dorothea, over the years. What an exciting get-together that was! TWO WELL KNOWN Bay Area faces found themselves being honored recently as they marked a couple of special birthdays. The first was in Kemah when former Councilwoman Kelly Williams hosted a houseful of friends to help husband, Paul, celebrate his big 5-0. A few days later, several friends of long-time community volunteer Martha Ferebee were on hand to help her celebrate her 75th birthday. SEVERAL LUCKY Clear Creek ISD seniors will be heading off to college with $16,000 scholarships provided by the Houston Endowment. They were among the 320 Houston area students selected by the Houston Rotary Club as Jones Scholars with selection based on academic achievement, leadership skills, economic need, community service and character. Clear Brook High – Burgundy Anderson, Christina W. Chan and John B. Pinard IV.